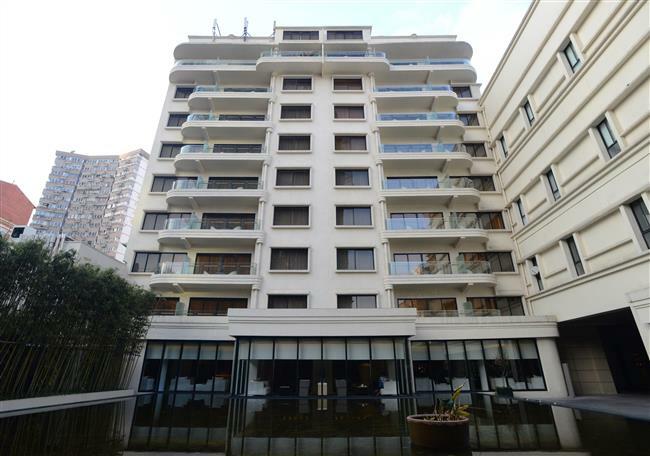 Referred to as “the most modern building in East Shanghai,” Hubertus Court shows how architect Laszlo Hudec married form and function to make buildings that stand the test of time. Hubertus Court’s simple south fa?ade features milky stucco and cantilevered balconies with curved corners. Nicknamed the “Little Park Hotel,” Hubertus Court is a Laszlo Hudec building in every way. His company financed it, Hudec himself designed it and his family lived in it. The architect who has left such a lasting legacy in the city spent his last Shanghai years in this modern apartment building on Yan’an Road W. It was an era of transition for the Hudec family, as well as for the city they would sadly leave behind. “Hubertus Court was a very important project for Hudec. He invested his own money in the enterprise and his family lived on the ground floor, now a hotel lounge,” says Italian architectural historian Luca Poncellini. In the 1920s and 30s, Shanghai enjoyed a golden period which led to a construction boom in the city. Huge profit had attracted hordes to the city who invested in real estate, including Hudec. Due to the growing population and scarce land, tall apartment buildings became the norm and Hudec registered his own company, Hubertus Properties Fed Inc. Covering an area of 3,000 square meters, the butter-hued Hubertus Court was built in 1937 as an apartment building with leased flats. The simple shape and smooth horizontal lines reflect a strong modern European influence. The Spanish magazine compared this “thorough Western architecture in a complete Oriental environment” with a group of residential buildings in England, Prague and Milan. “When designing residential buildings in Shanghai, architects have two factors to contemplate, preventing summer heat and separating masters’ living space from servants. The former is crucial since afternoon sunlight penetrating into rooms from the west and southwest sides would considerably impact lives of the residents,” the report said. An archive photo of the north fa?ade of the Hubertus Court. According to the report, Hudec carefully considered sunrise and sunset positions in Shanghai’s winter and summer months as well as wind directions in the four seasons. Large glass windows and central air-conditioning were designed to cope with hot weather. The flats featured a simple, comfortable style with inlaid furniture, indirect lighting and wooden floors. Servants’ rooms were arranged around two courtyards. There was a big garden for children. “However, the most impressive are those large windows, which are very trendy in European and American residences now,” the magazine added. Nearly 80 years later, Hubertus Court is not outdated at all. The body features a modern compact layout, a simple facade of milky stucco and cantilevered balconies with curved corners. It’s easy to imagine how “modern” it looked in the 1930s. Despite the modern look, it was very functional. The ground floor used to have a suite facing the big garden. This is where Hudec and his family lived. A standard floor included three suites. Two four-bedroom suites were arranged on either side. Each had a big balcony facing south and a kitchen and servant’s room in the north. The balcony was so long and spacious that it could be used for sunbathing or outdoor dining. A smaller two-bedroom suite sat in the middle. The rents were higher for flats on higher floors as they had more privacy and better views. The top two floors had only two suites, each with terraces. “Hubertus Court is no doubt a very modern building in its conception, perhaps with more expressionistic inspiration; the design pursues the articulation of volumes and forms — sharp angles, round corners, vertical extrusions — in which Hudec blended a few little details that remind of the previous Art Deco times,” Poncellini says. “Hubertus Court has always looked like a ‘German’ building as it features many formal similarities with other modern buildings built in Germany those years. Plus it is extremely sober and essential, without ornaments or in-style decorations,” he adds. 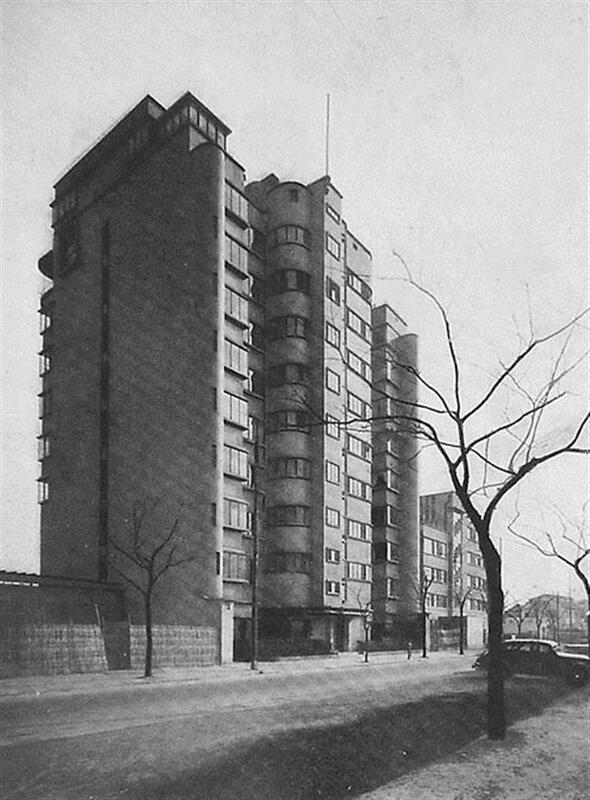 In 1940, the Japanese magazine Kokusai Kenchiku, which covered the world’s most important architectural projects, mentioned Hubertus Court, further proof of Hudec’s international reputation. But life in the “Little Park Hotel” wasn’t always sweet for Hudec. According to his 86-year-old daughter Alessa de Wet, Hudec had a bachelor apartment at Hubertus Court that he used when his wife and children were out of the city. As they usually traveled for extended periods, he would close up the Columbia Road house and have some of his furniture relocated to the apartment. He would live there for the duration as it was cheaper to run and easier to maintain than a large house. In the autumn of 1938 Laszlo moved his family to Hubertus Court as he had rented the Columbia Road house out just prior to an extended trip of 11 months overseas. Upon the family’s return to Shanghai, they moved permanently to Hubertus Court. The Hudec couple and Alessa lived in the ground-floor apartment, while his parents-in-law lived in a studio apartment on the second. Archive photos showed a similar interior décor to the family’s home on Columbia Road. The years spent in the butter-hued building happened to be the war times when bread and sugar were rationed and gasoline and electricity were not always available. The water for Hubertus Court came from a 1,000-feet-deep (300-meter-deep) well, which required an electric motor to pump the water to the top of the building. “Since the power supply was intermittent, my father converted a motor car engine to run on wood as a driving force for the pump. Huge piles of wood had been delivered to supply the building for this reason,” de Wet recalls, whose narration was compiled and recounted by Hudec’s granddaughter-in-law, Anne Hudec, in Canada. As gasoline was also scarce, she remembers riding her bike to the market with her mother to buy food. 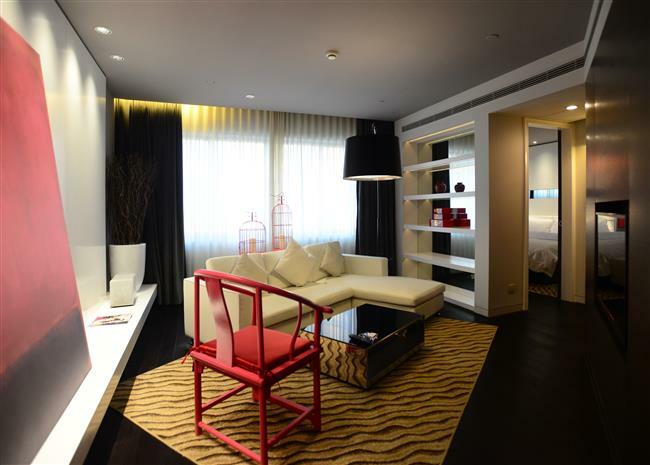 The Hubertus Court has been renovated into a stylish yet reasonably priced boutique hotel ─ Jinjiang Metropolo Hotel Dahua. The building was renovated after 1949 and became Da Hua Restaurant and later the state-owned Da Hua Hotel. 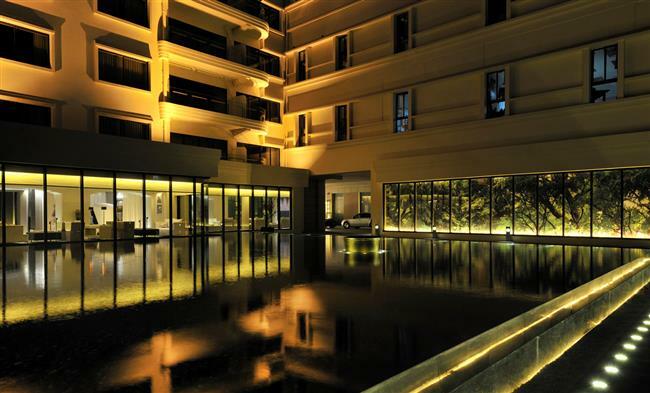 It was renovated again in 2011 and is now Jinjiang Metropolo Hotel Dahua, which features 111 suites and rooms. A nice pool was added in the former yard. Most historical traces are long gone but relief of Hudec hangs near the entrance. Long balconies and the large glass windows are well preserved. They are selling points for the hotel that targets middle-class travelers. Amid the city’s political and warring turmoil in January 1947, Hudec’s family secretly boarded the S.S. President Polk and sailed to Europe. He gave up many Shanghai properties including Hubertus Court. But his building and former home remains. Just one part of the Hudec legacy that has had a lasing impact on Shanghai. A nice pool has been added in the former yard of the Hubertus Court. Address: 918 Yan’an Rd W.
Tips: The facade can be appreciated from the garden and on Yan’an Road W. The view from Yan’an Elevated Road is perfect. The lobby of the hotel is open to the public. I suggest visitors have a coffee in the lobby, where Hudec used to have an apartment, as the view of the pool gives a Zen feel.